I love naughts and crosses, it's easy to play, and a great learning game for kids. This easy origami project doesn't take too long, and is simple enough for kids to make - with your help. You could make them as big or small as you like. Just start with the same sized paper at the beginning. 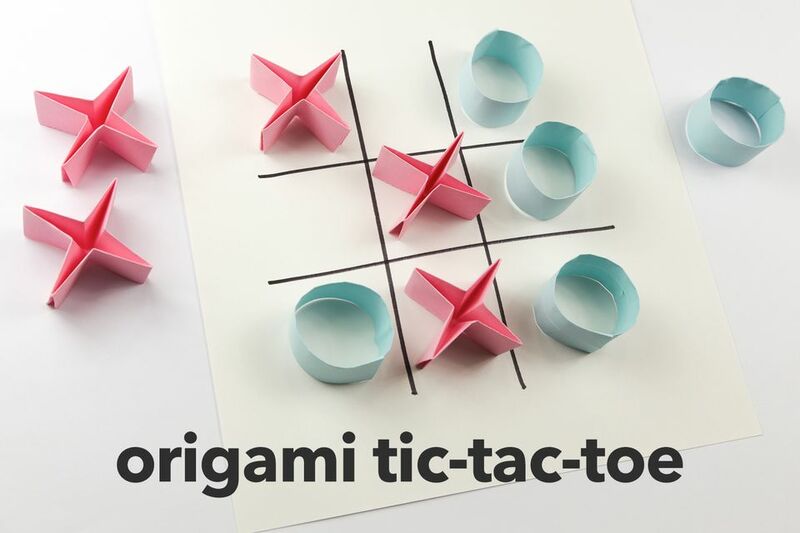 For a more 'grown up' version that I made, check out Origami Tic Tac Toe - Naughts & Crosses Game on my youtube channel. For another easy origami game, check out the Traditional Origami Menko Card Tutorial. 1. You will need: 4 sheets of 15 x 15 cm. 2 sheets of one colour and 2 of a different colour. We'll be cutting the paper. So you'll need scissors or a cutting tool. 2. Start with the paper you'd like to use for the X's. Fold the paper in half, top to bottom and right to left. There are now 4 equal square sections. 3. Cut the sections out on both sheets, you'll be left with 8 squares, we only need 5 squares. 5. Fold the paper in half, top to bottom and right to left. There are now 4 equal square sections. 6. Fold the top and bottom edges to the middle. 7. Unfold and then fold the left and right edges to the middle. 9. Flip the paper over to the other side. 10. Fold the paper in half diagonally. 11. Fold the paper in half diagonally the other way and unfold. 12. This is what you should have. 13. Flip the paper over to the other side. 14. Push in the corners. 15. Flip it over to the other side. 16. Push the edges inwards. 17. Fully collapse the paper into the middle. The X is complete! If you want it to be sturdier, you can glue the whole thing. Now we'll make the 0s. 1. Fold the paper in half top to bottom and then fold the top and bottom to the middle. Unfold. You now have 4 long sections. 2. Do the same for both sheets of paper, and then cut along the lines. Again, you only need 5 of these strips. 3. Take one of the strips as shown. 4. Fold the strip in half, bottom to top. 5. Shape the strip into a circle, use a round object such as a pen, or chopstick to round the paper out if you like. 6. There will be excess paper so cut some off. 7. Once your circle is how you like it, pop one end inside the other and smooth it out. 8. All's left to do is draw a grid for the game! I hope you enjoyed making (and playing) the origami naughts and crosses!